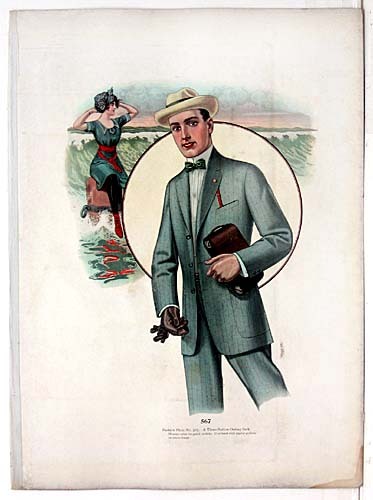 This afternoon I accompanied my gentleman companion to a men’s clothier to buy some shirts. Retail clothes shopping for men is an entirely different proposition than for women. Observing the process was an eye-opener for me. The salesmen, for starters, all carry measuring tapes about their necks. “Here, let me measure you first,” they offered each man, to make sure the selection he had made would fit him before he even approached the dressing room. In this world, it was clear, numbers matter. This clothing follows the numbers. Then they measure the arm: from center spine at the base of the neck, to the point of the shoulder, to the elbow, and down to the break of the wrist, for the full arm measurement. And then, armed with these two numbers, a man can then approach the selection of shirts with a focused search, knowing exactly what section is built for his body. I also learned about the variations in the slight line of the shirt collars, to distinguish styles: a spread collar, to balance a long, lean face–a moderate spread, or a pointed line to balance a wider face. The shirts, to me, all look identical in shape to begin with, but once you tune in to these subtle differences, a whole new world of style opens up–subtle lines and angles to distinguish and complement the angles of the face and body. And I watched the way men try on clothes, for fit. “Come sit down over here,” one salesman gestured to a bench, so that he could inspect the way his client’s pants lifted when the leg bent to sit. I admit, I was jealous. Imagine, for one moment, a similar setup for women’s clothing. Salespeople armed with tape measures, and a directed, two-point measurement scale that helps you find the size that’s best for your body. Hanging a garment from one’s neck and shoulders, and tailoring the rest to fit once the top is properly in place. A standardized sizing system, with everything sorted appropriately. And most of all, a dressing room etiquette that’s focused on finding the garment that fits properly, that skims your body in all the right places and hangs to all the right levels without wrinkling, and with that on-staff tailor who will take in the extra fabric and lift the hemline, in some cases before you even pay for your purchase. Instead we are left to struggle with armloads of choices with few returns. Salespeople in women’s stores will bring you another size, from the other side of the door, but when you step out in front of the three-way mirror they would never helpfully point out the way it wrinkles wrong in the back, and bring out the tailor to adjust it. If the rise is too low or the shoulders too sloped, there’s no size just one inch up or down to reach for, no subtle variation on the same style–instead you’re left to wander the sales floor, alone, to find some other thing that might do as a replacement, some style that might draw the eye differently or where the fabric disguises the way the garment doesn’t quite fit. If there’s one thing this project has shown me, it’s that years of buying clothing off-the-rack has left me without a scale for proper fit, and that even making my own clothing, I’m often shooting in the dark. Left without a clear set of standards–where and how to measure length, circumference, rise and inseam, even though I try to tailor my own garments, I end up with lopsided results. Today, I wish I had my own in-house tailor, at $15 an item.